when pigs fly, originally uploaded by jahansell. 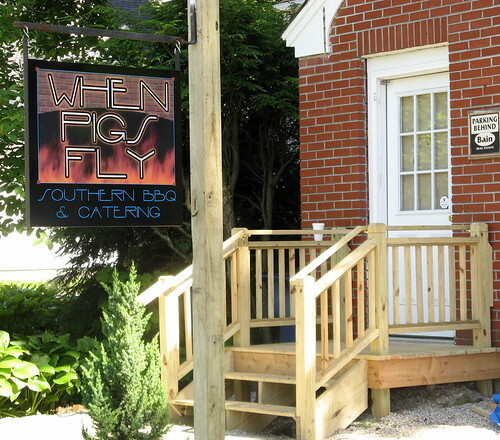 They're not open yet but any day now...real southern barbecue in our little New England town. The late lamented Little Brick House became Cafe Tazza last year - briefly. Now it's been empty for several months. But work began a few weeks ago, and the sign, designed and made by my friend Todd Tufts - call him if you need a sign! -- went up last week. The storefront is tiny, but he's doing the cooking outside in a huge smoker, which makes more room inside to eat. There is another bbq in the area - West Cornwall has a wonderful one. But it feels so far away - I've only been there once. I'm sure I'll be at this one at least weekly! I like the sign, Jenny, and also the idea of the new place. Thanks for mentioning my name Jenny, I appreciate it. We've had the food and it's very Yummy! Horrible. In the south, you do not wait 30 minutes for a pulled pork sandwich. It's an already prepared item. Simply has to be put together. They smoke their ribs, but everything else is made with liquid smoke. Never Again!!!!! Anonymous, I'd have taken your comment more seriously if you'd signed your comment! But I'm curious to know what others think! I've eaten there twice and thought it was great both times. Anyone else have an opinion?